How do we help our clients navigate through the multitude of diets, food choices, fat loss programs, and ideas about what to eat and what not to eat? Moreover, how do we help our clients with fat loss while not going out of our scope of practice? Without question, there is so much information available to our clients and most are struggling to understand it all as they seek long-term, successful fat loss. Within this context, there is a re-emergence of eating more protein to help with fat loss and weight maintenance. To this end, this article will discuss the concept of increasing protein consumption as a means of improving satiety, reducing hunger pangs and eating less food. Understand the important role protein plays with most functions and structural components of the body. Explain satiety as it relates to eating less food to help with fat loss/maintenance. Describe the “Protein Leverage Theory” in relation to increased protein consumption and improved satiety after a meal. Explain why it is important to have a snack of carbohydrate and protein within 30 – 60 minutes after a workout. Protein may be the most “underappreciated” or “underrated” nutrient as it relates to fat loss and weight maintenance, compared to other essential nutrients. This is especially true when we realize the importance of protein to all body functions. Protein is made up of amino acids, which are referred to as the “building blocks.” There are 20 different amino acids, nine of which are “essential amino acids” that cannot be produced by the body and must be consumed as part of the diet. The other eleven amino acids are produced by the body. 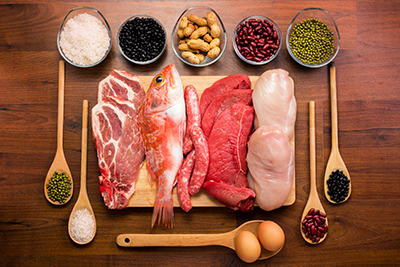 A complete protein (or “high quality protein”) contains all of the essential amino acids and come from various animal-based foods: meat, poultry, fish, milk, eggs, and cheese. An incomplete protein is low in one or more of the essential amino acids. Complementary proteins are two or more incomplete protein sources that together provide adequate amounts of the essential amino acids. Protein serves important structural (skeletal muscle) and functional (enzymes) roles in the body, and is a valuable component for all cells. Protein is important for muscle and bone health; organ health; and tendon and ligament strength. Likewise, it aids in forming enzymes and hormones that send messages through the body's bloodstream for proper functioning of thyroid glands, adrenal glands, the pancreas and other organs. In addition, protein assists in blood transport and blood clotting; is essential for tissue maintenance and repair; as well as helps in maintaining the fluid balance inside and outside cells. Simpson and Raubenheimer (2005) indicate most of the emphasis in weight loss is on changing fat and carbohydrate consumption. The role of protein has been ignored because the diets of most populations are typically comprised of only 15% protein; which may relate to the development of the so-called obesity epidemic. The Protein Leverage Theory indicates that our protein requirement influences our consumption of carbohydrates and fat. That is to say, when protein is dense in our diet, we eat less carbohydrates and fat. This is understandable because protein is the most satiating macronutrient group for humans. Gosby, et al. (2011) wanted to test the Protein Leverage Theory. The researchers created three menus consisting of varying amounts of protein: low (10%), intermediate (15%) and high (25%) protein (based on World Health Organization’s daily recommendation of 15% protein). With the exception of protein amounts, the three diets were identical in all other factors such as appearance, palatability, variety and availability. There were twenty-two lean participants in the study who were fed each of the three menus during three separate four-day periods. Energy intake was monitored over each four-day period and hunger ratings were recorded on day four. The researchers found that the subjects who ate the low (10%) protein diet consumed 12% more energy over 4 days, compared to those eating an intermediate (15%) protein diet. The researchers also found that 70% of the increased energy intake by participants on the lower protein diet was attributed to snacking. "This result confirms the 'protein-leverage' effect in humans and importantly, shows counting calories is not enough to manage appetite and body weight. In the western world, where food is abundant, if you reduce your calorie intake but fail to reach your protein target you will find it hard to resist hunger pangs." 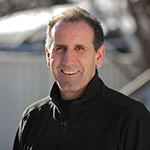 Moreover, Halton and Hu (2004) indicate that there is convincing evidence that a higher protein intake increases thermogenesis (energy expenditure above the resting metabolic rate due to the energy cost of processing and digesting food for use and storage) and increases satiety compared to diets of lower protein content. The body of evidence also suggests that high protein meals lead to reduced excess food consumption by reducing either snacking or consumption of carbohydrates and fat during a meal. It may be beneficial to partially replace refined carbohydrate with protein sources that are low in saturated fat. Westerterp (2004) points out that daily energy expenditure consists of three components: basal metabolic rate, diet-induced thermogenesis, and the calories burned during physical activity. Macronutrients are burned for energy after a meal in the sequence of alcohol, protein, carbohydrate, and fat. A mixed diet results in a thermogenic energy expenditure of 5 to 15 % of daily energy expenditure. However, these values are higher at a relatively high protein consumption and lower at a high fat consumption. Again, like other researchers, Westerterp (2004) indicates that protein induced thermogenesis has an important effect on satiety. Based on this research, we can tell our clients that if they increase the amount of protein they eat at each meal (above the current recommended dietary allowance [RDA]), they will not be as hungry and less likely to snack; which can benefit fat loss or weight maintenance. Humans have a strong appetite for protein and when the percentage of our total food consumption of protein is low, we tend to consume more calories from other nutrients. We can also tell our clients that by increasing protein intake up to 15% of their diet, they will feel more full even when eating less. Based on the RDA above, increasing protein up to 15% means males, 19 - 70 years old, would consume 64.4 grams of protein daily (~21.5 grams per meal, if three meals are consumed per day). Breakfast: Egg and low fat cheese breakfast burrito = 25 grams of protein. Lunch: Homemade tuna sandwich = approximately 13 - 15 grams of protein. Adding low fat yogurt boosts total protein by approximately 12 grams, for a total of 25 - 27 grams. Dinner: Grilled chicken breast = approximately 20 grams of protein. Protein, in combination with some carbohydrate (e.g., chocolate milk), starts the process of repairing damage done to the muscle tissue during a high intensity workout. If our clients can get a “head start” on repairing the exercise-induced muscle damage, they can be best prepared for their next workout. The body may experience a temporary decrease in immune system function, making us more susceptible to catching a cold or the flu, especially after a high intensity training or a long duration workout. Consuming protein (with carbohydrate) after a workout can boost immune function, reducing the risk of catching a virus. Muscle cells are more readily available to receive both protein and carbohydrate post-workout. When our clients start to replenish carbohydrate stores, they are preparing to have good energy for the next workout. When we eat food it moves into the blood as glucose. An increase in blood glucose (blood sugar) then stimulates the production of insulin. The insulin acts as a “key” to open the muscle cell and allows protein and carbohydrate to enter and start the process of recovery, as well as prepare for the next workout. Eating for fat loss or weight maintenance is an important aspect of a complete health and fitness program for many of our clients. While keeping within our scope of practice, personal trainers can offer suggestions to clients about food choices. One suggestion is to increase the amount of protein that is consumed each meal. The key is satiety, the feeling of being satisfied with the meal we have eaten. The Protein Leverage Theory indicates that when humans eat more protein at each meal, it enhances their feelings of being satisfied with the amount of food consumed, and it decreases the likelihood that they will either snack between meals or eat more food at each meal. Simpson, S.J., & Raubenheimer, D. (2005). Obesity: the protein leverage hypothesis, Obesity Reviews, 6, 133–142. Gosby, A.K., Conigrave, A.D., Lau,N.S., Iglesias, M.A., Hall R.M., Jebb, S.A., … Simpson, S.J. (2011). Testing Protein Leverage in Lean Humans: A Randomised Controlled Experimental Study, PLoS ONE 6(10): e25929. doi:10.1371/journal.pone.0025929. Halton, T.L. and Hu, F.B. (2004). The effects of high protein diets on thermogenesis, satiety and weight loss: a critical review. J Am Coll Nutr., 23(5):373-85. Westerterp , K.R. (2004). Diet induced thermogenesis, Nutrition & Metabolism, 18;1(1):5. Stark, M., Lukaszuk,J., Prawitz, A., and Salacinski, A. (2012). Protein timing and its effects on muscular hypertrophy and strength in individuals engaged in weight-training, J Int Soc Sports Nutr. 14;9(1): 1186/1550-2783. Protein 101: How Much with Each Meal? How Much Protein Does Your Personal Training Client Really Need?